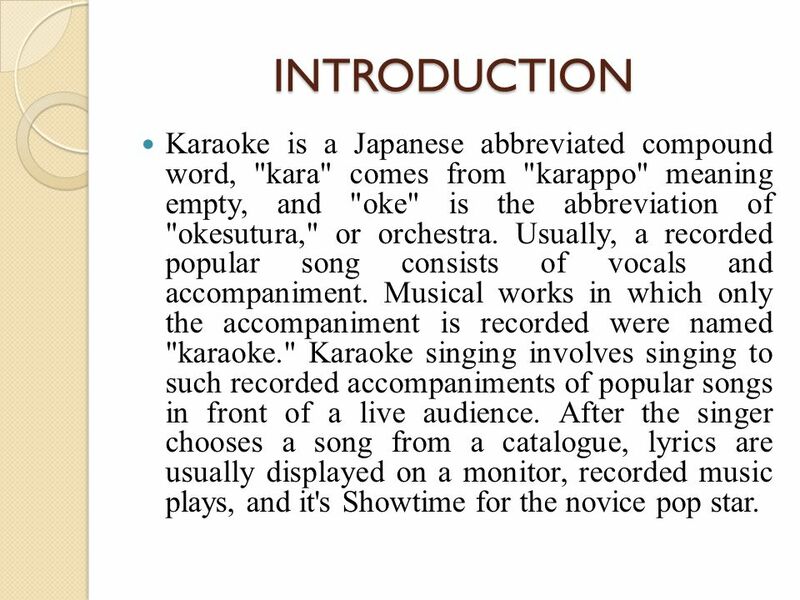 2 INTRODUCTION Karaoke is a Japanese abbreviated compound word, "kara" comes from "karappo" meaning empty, and "oke" is the abbreviation of "okesutura," or orchestra. Usually, a recorded popular song consists of vocals and accompaniment. Musical works in which only the accompaniment is recorded were named "karaoke." 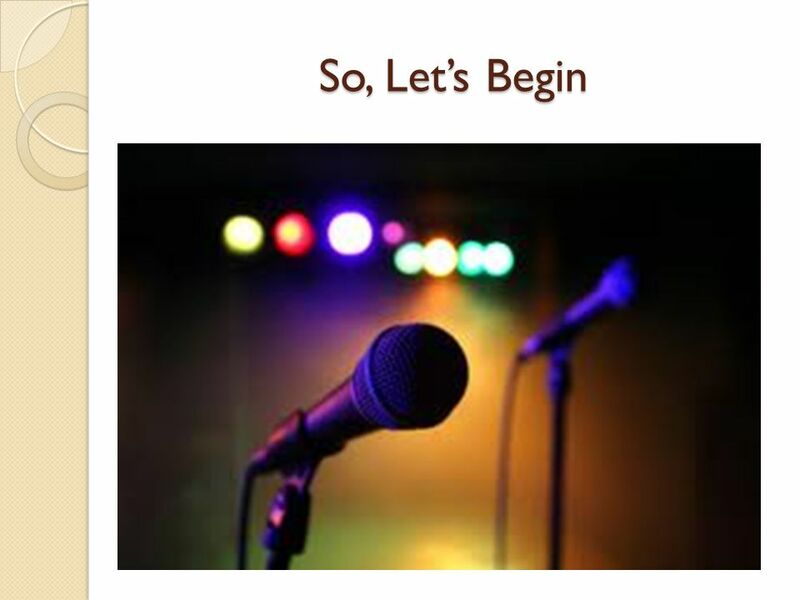 Karaoke singing involves singing to such recorded accompaniments of popular songs in front of a live audience. After the singer chooses a song from a catalogue, lyrics are usually displayed on a monitor, recorded music plays, and it's Showtime for the novice pop star. 3 INTRODUCTION (cont.) Invented in the late 1970's, the wild popularity of karaoke over the years has swept this form of singing into the mainstream throughout the world. 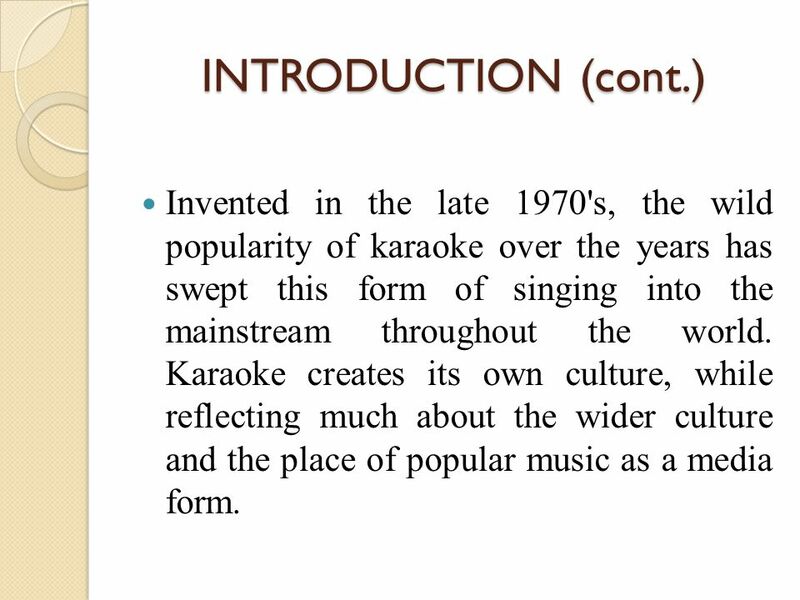 Karaoke creates its own culture, while reflecting much about the wider culture and the place of popular music as a media form. 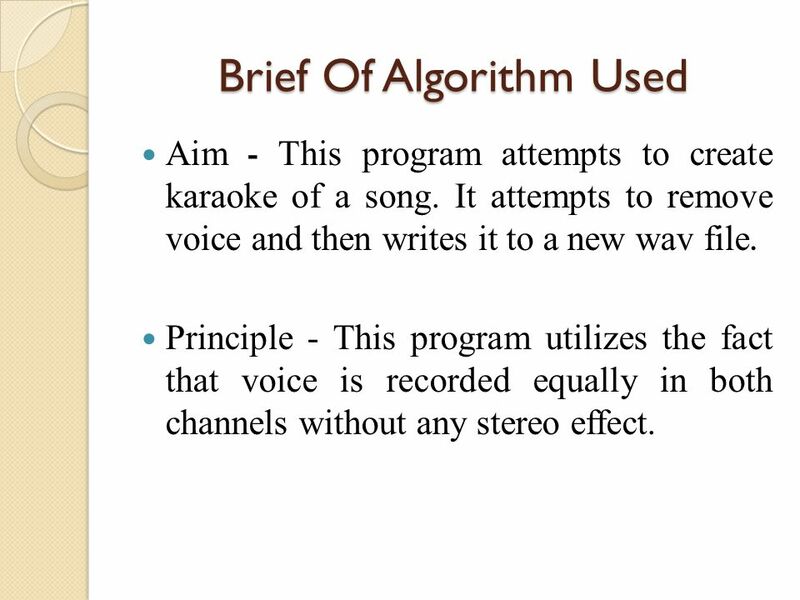 4 Brief Of Algorithm Used Aim - This program attempts to create karaoke of a song. It attempts to remove voice and then writes it to a new wav file. Principle - This program utilizes the fact that voice is recorded equally in both channels without any stereo effect. 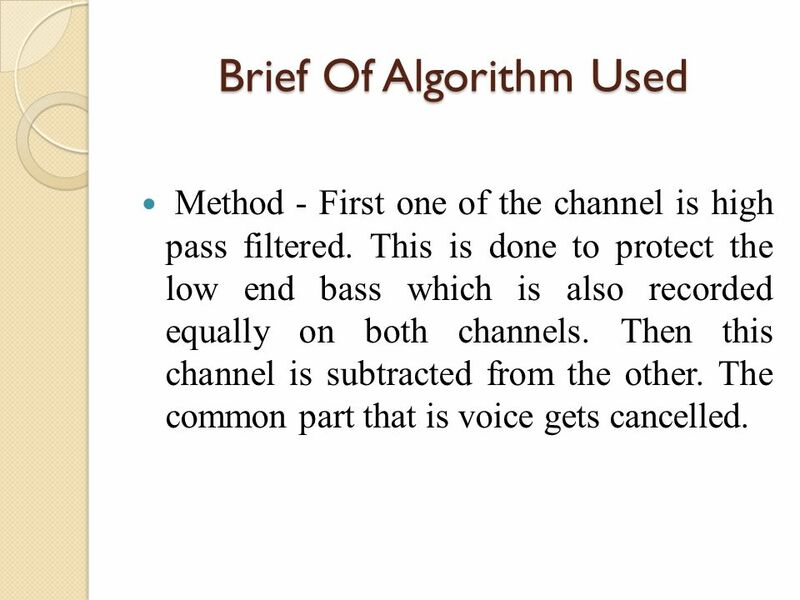 5 Brief Of Algorithm Used Method - First one of the channel is high pass filtered. This is done to protect the low end bass which is also recorded equally on both channels. Then this channel is subtracted from the other. The common part that is voice gets cancelled. 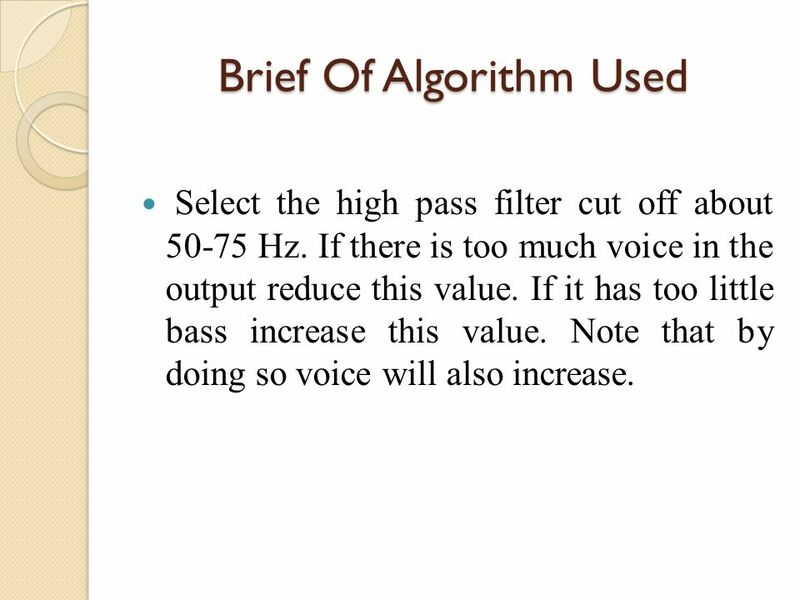 6 Brief Of Algorithm Used Select the high pass filter cut off about 50-75 Hz. If there is too much voice in the output reduce this value. If it has too little bass increase this value. Note that by doing so voice will also increase. 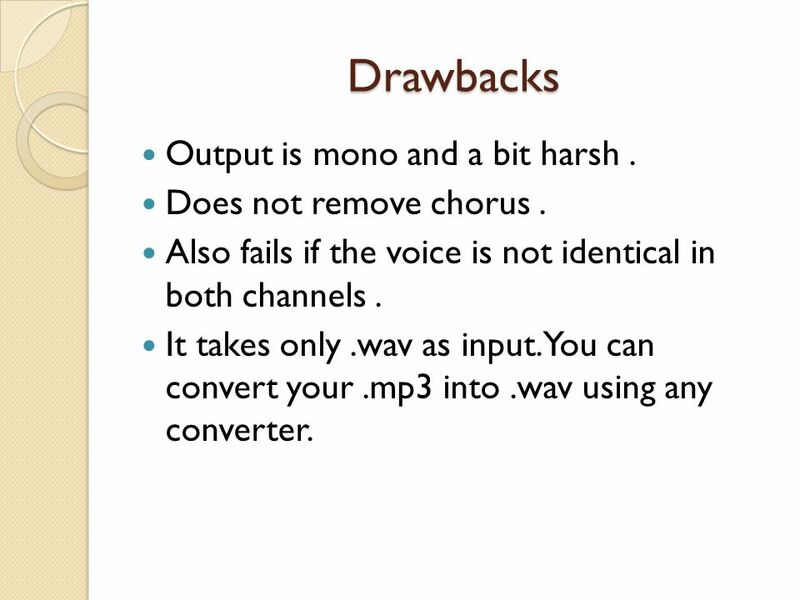 7 Drawbacks Output is mono and a bit harsh. Does not remove chorus. Also fails if the voice is not identical in both channels. It takes only.wav as input. You can convert your.mp3 into.wav using any converter. 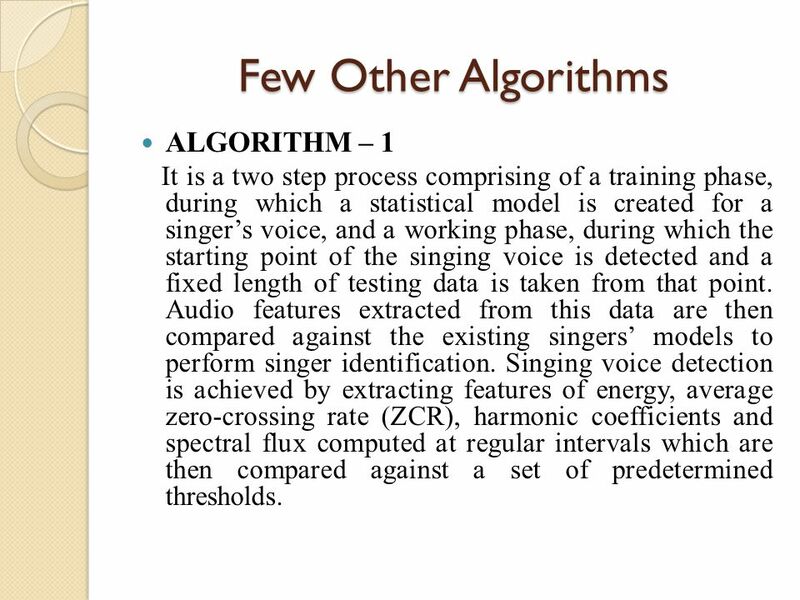 9 Few Other Algorithms ALGORITHM – 1 It is a two step process comprising of a training phase, during which a statistical model is created for a singer’s voice, and a working phase, during which the starting point of the singing voice is detected and a fixed length of testing data is taken from that point. Audio features extracted from this data are then compared against the existing singers’ models to perform singer identification. Singing voice detection is achieved by extracting features of energy, average zero-crossing rate (ZCR), harmonic coefficients and spectral flux computed at regular intervals which are then compared against a set of predetermined thresholds. 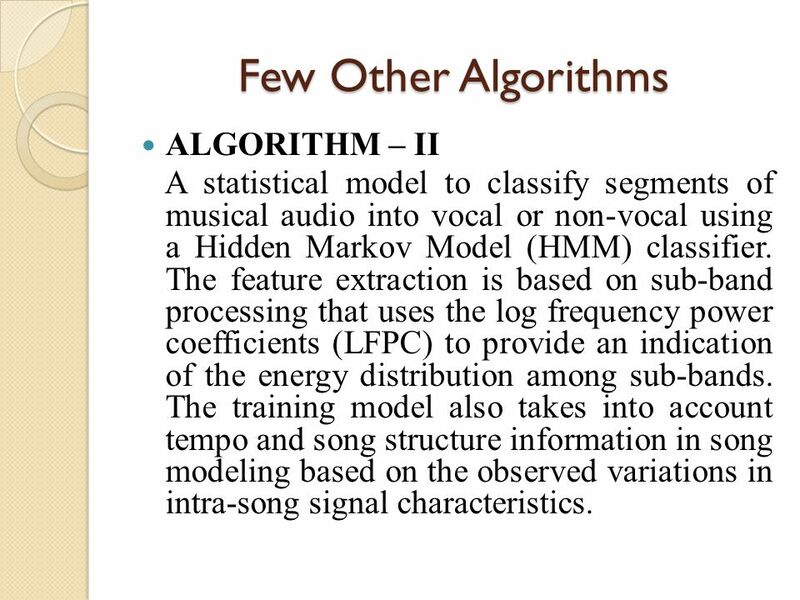 10 Few Other Algorithms ALGORITHM – II A statistical model to classify segments of musical audio into vocal or non-vocal using a Hidden Markov Model (HMM) classifier. The feature extraction is based on sub-band processing that uses the log frequency power coefficients (LFPC) to provide an indication of the energy distribution among sub-bands. The training model also takes into account tempo and song structure information in song modeling based on the observed variations in intra-song signal characteristics. 11 Future Advancement To Transcribe the lyrics - but this is currently impractical. Transcription of lyrics using speech recognition is an extremely challenging task as singing differs from speech in many ways. 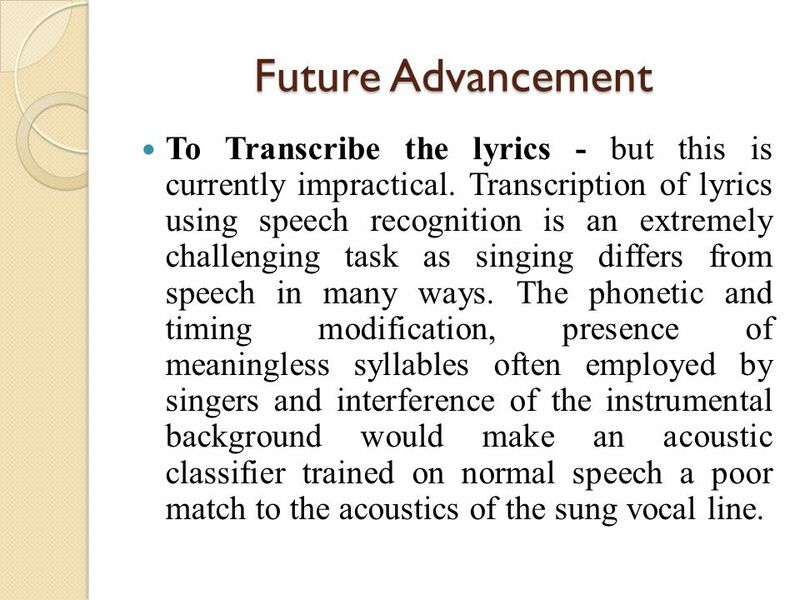 The phonetic and timing modification, presence of meaningless syllables often employed by singers and interference of the instrumental background would make an acoustic classifier trained on normal speech a poor match to the acoustics of the sung vocal line. 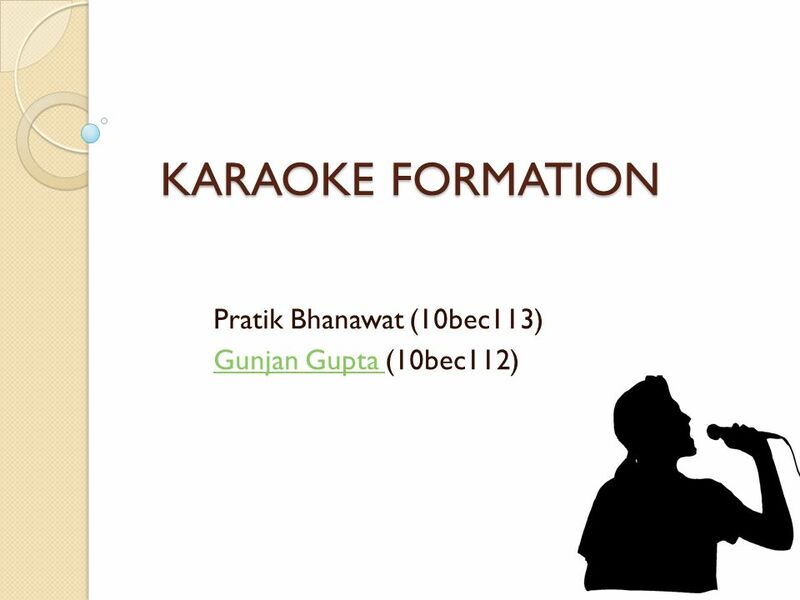 Download ppt "KARAOKE FORMATION Pratik Bhanawat (10bec113) Gunjan Gupta Gunjan Gupta (10bec112)"
Audio Compression ADPCM ATRAC (Minidisk) MPEG Audio –3 layers referred to as layers I, II, and III –The third layer is mp3. Pro Tools 7 Session Secrets Chapter 6: After the Bounce or Life Outside of Pro Tools Life Outside of Pro Tools. Digital Audio Production Munsang College Information and Communication Technology S2. Chapter 4: Representation of data in computer systems: Sound OCR Computing for GCSE © Hodder Education 2011. Computational Rhythm and Beat Analysis Nick Berkner. Toward Automatic Music Audio Summary Generation from Signal Analysis Seminar „Communications Engineering“ 11. December 2007 Patricia Signé. Outline Introduction Music Information Retrieval Classification Process Steps Pitch Histograms Multiple Pitch Detection Algorithm Musical Genre Classification. Introduction The aim the project is to analyse non real time EEG (Electroencephalogram) signal using different mathematical models in Matlab to predict. December 2006 Cairo University Faculty of Computers and Information HMM Based Speech Synthesis Presented by Ossama Abdel-Hamid Mohamed. Feature Vector Selection and Use With Hidden Markov Models to Identify Frequency-Modulated Bioacoustic Signals Amidst Noise T. Scott Brandes IEEE Transactions.